Decent people of all backgrounds, beliefs and nationalities have been horrified these past few days by the gruesome acts of the group calling itself Islamic State: two beheadings and one immolation, captured on video and sent around the world via the Internet to be seen by anyone willing watch. If calling attention to itself and sickening others was the intent of these actions, it could be said that IS succeeded. But in other ways, the group has failed, massively. That two of these individuals were Japanese nationals put IS in the spotlight in Japan, Asia and, of course, in this community, in a way that it may not have before. No more thinking along the lines of “this happens to other people, not us.” If that was the thinking in Japan, anyway, it’s not anymore. In the case of Jordanian fighter pilot Lt. Muath Al-Kaseasbeh, we know that he was captured after his F-16 crashed in December and that he was there because he was serving his nation. Kenji Goto was in the danger zone because he was a journalist covering the story, just like the other journalists similarly slain by IS. As for Haruna Yukawa, I’m not sure about his reasoning (or lack thereof) for willingly going to a place where one’s capture could mean doom. In a way, it doesn’t matter why they were there. All three are dead now, leaving behind a shocked world and grieving friends and families. It does, however, put more pressure on those who would defend Islam as a “religion of peace,” as it is often called. The aforementioned acts, plus seemingly dozens of other acts and potential acts of terror by individuals and groups who claim they are following true Islam has nearly everyone looking askance at all Muslims. 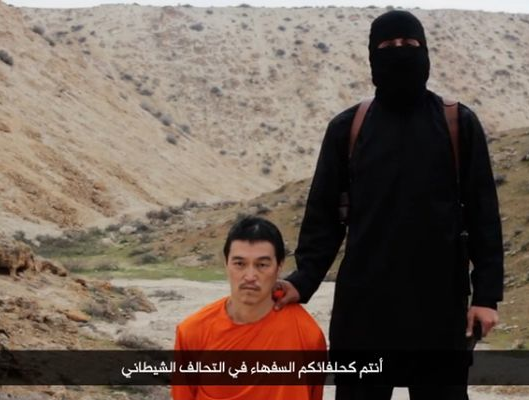 Journalist Kenji Goto is seen in a video released by his Islamic State captors. 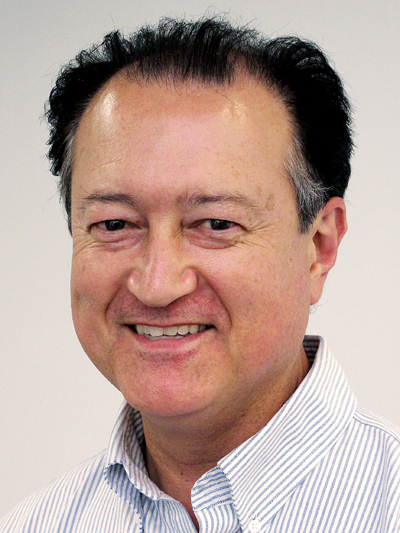 In our community, there have been individuals and groups who since the early days after 9/11 reached out to Muslims and those of Middle Eastern backgrounds to ensure that what happened to Japanese Americans during WWII, thanks to Executive Order 9066, didn’t happen again to another group that happened to share characteristics of those who committed terrorist acts. Hard as it may be, however, it is still incumbent upon us to embrace those who are Muslim or of Arabic or Persian heritage who are righteous, peace-loving people who are not in league with or sympathetic to the goals of IS, al-Qaida, the Taliban, Boko Haram, et al. It’s also important to figure out why so many young people, mostly young men — many well-educated — become attracted to the lunatic fringe of Islam. Maybe these individuals who feel disconnected, disaffected and disenfranchised can be saved from this path, thus saving innocent others from their actions when they are turned toward a life of religious violence. Call it enlightened self-interest. In actuality, the actions of IS not only have inflamed Western powers and peaceful nations uninvolved in the conflicts in that region of the world; IS’ continued acts of terror against defenseless hostages are causing those who might be seen as their base, their potential allies and siblings to turn against them. This is what I mean by failing massively. To me, the behavior and actions of IS are like those of a misbehaving child who has suddenly gained some power and wants to strike out at supposed oppressors or authority figures. These acts of horror, if they attract any support, only attract others with feeble minds and immature sensibilities. The beheadings and immolations, mass shootings and attacks in Boston, Ottawa, London and Paris do shock and gain attention — but they don’t make friends. If anything, it is backfiring in the biggest way because it has made enemies of and repelled those who might have been silently supporting what IS and its ilk were doing, especially after the senseless killing of Al-Kaseasbeh. In this world, there are many pressing problems and much unnecessary suffering. While the actions of IS have certainly gained our attention, for now, my feeling is that after some stunning gains that caught the U.S. off guard, they are backpedaling now. Despite the newspaper ink and TV and Internet bandwidth they have received, IS is not our biggest worry, not by far. In the months and years to come, they will fail and fall, and those with the most to lose if IS grows — fellow Muslims who aren’t of that twisted mindset — will be a part of the solution. A “Boat” Returns Dept. : If you’re reading this on publication day, then the two episodes of ABC’s sitom “Fresh Off the Boat” that debuted Wednesday night have already aired. (It will air on Tuesday nights at 8 p.m. on ABC beginning next week.) I’ve not seen the show, and I’ve not actively sought it out — but I’ve heard mostly good things about this latest attempt to launch an Asian American sitcom. Since the 1970s, spaced apart by about 20 years or so, ABC has valiantly tried to launch a sitcom populated by Asian Americans. Post-“Happy Days” but pre-“Karate Kid” Pat Morita tried in the mid-1970s to anchor a zany sitcom titled “Mr. T and Tina” about a Japanese immigrant inventor. Fast-forward two decades to the mid-1990s and ABC tried again with Margaret Cho and “All American Girl,” about a young Korean American woman and her family. It outlasted the previous attempt but was still after less than one full season. 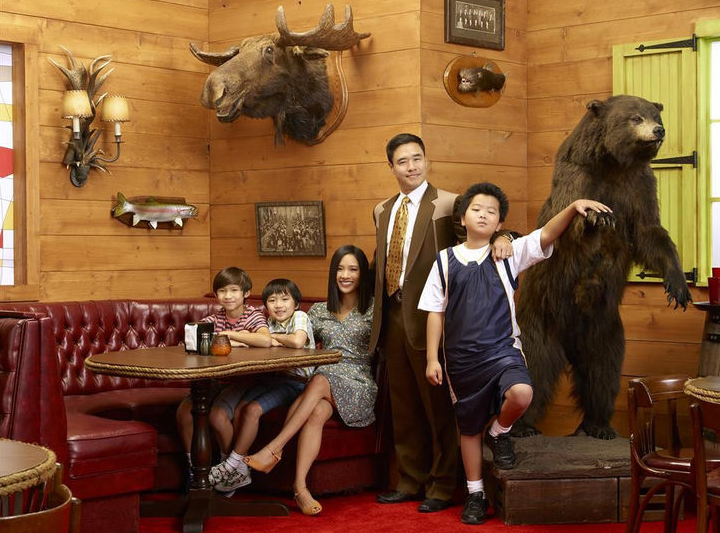 Now, about 20 years after the Cho show, ABC is trying again with the sitcom “Fresh Off the Boat,” about Taiwanese immigrants. Will this third time be the charm? Hmm. I hope so — but I don’t want to get those hopes too high. As many have said, timing is everything. Fortunately, the landscape has changed since “All American Girl” came and went, much of it for the better, throughout popular culture. The main thing is, “Fresh Off the Boat” needs to be good, needs to be funny. From everything I’ve read, it is. Regardless, kudos for ABC for not giving up, even if the network does it in 20-year intervals. In the meantime, a couple of pilots are in the works, one with Ken Jeong (TV series “Community,” motion picture franchise “The Hangover”), another a TV version of movie franchise “Rush Hour.” It’ll bode well for those examples if “FOB” thrives. It makes me think, however, of a show I wrote about in this space in 2006, titled “My Life … Disoriented.” It was very good, more of a dramedy than an out-and-out sitcom. It went nowhere, although clips can be found on YouTube. 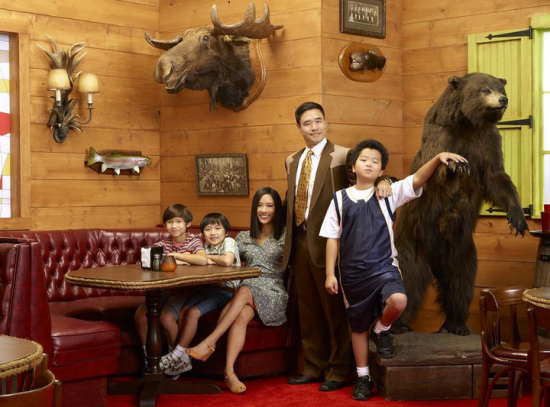 I predict, however, that should “Fresh Off the Boat” fail, it won’t be another 20 years before ABC (or another network) tries again to have a sitcom (or a drama, even) about an Asian American family. That’s one good thing that has also changed since “All American Girl” came and went.